Ultiworld’s 2018 Club Awards are presented by Greenbackr, a custom crowdfunding platform from Savage; all opinions are those of the authors. Please support the brands that make Ultiworld possible and utilize Greenbackr! With Nationals over and the winners crowned, it is time to take a moment to recognize the top performers in the mixed division this season. While the talent of the division reaches far beyond short lists, the Club Awards are meant to honor those players who put together what we believe to be the best seasons in the mixed game this year. While we consider both regular season and postseason performance, because of the nature of the Club Division, we weight success in the Series and at Nationals above all else. 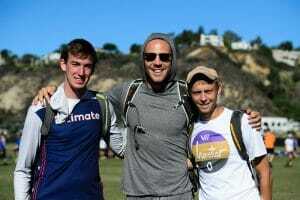 The Club Awards are selected based on input from Ultiworld reporters, contributors, and editors. To see the 2018 Club Mixed Player of the Year Award, go here. Think back to when Mac Taylor was playing on Revolver, and what comes to mind? Dominant downfield cutter, big thrower, aerial threat in the end zone? Well, this year was a vintage performance. He bounced back from an injury-riddled 2017 and turned the kind of multi-threat offensive campaign that cannot be ignored. San Francisco Blackbird was one of the teams to go all-in with the sidestack isolation pull play, and Taylor was usually at the heart of it. One of the scariest cutters to defend one-on-one, Blackbird cleared space to let him take on his mark and set up easy goals to keep San Francisco in the hunt for another bid. At Nationals, Taylor’s standout level of play continued. He put up eight goals and 18 assists in San Diego, pacing the Blackbird offense and giving his team the dominant downfield threat needed to upset AMP in pool play. 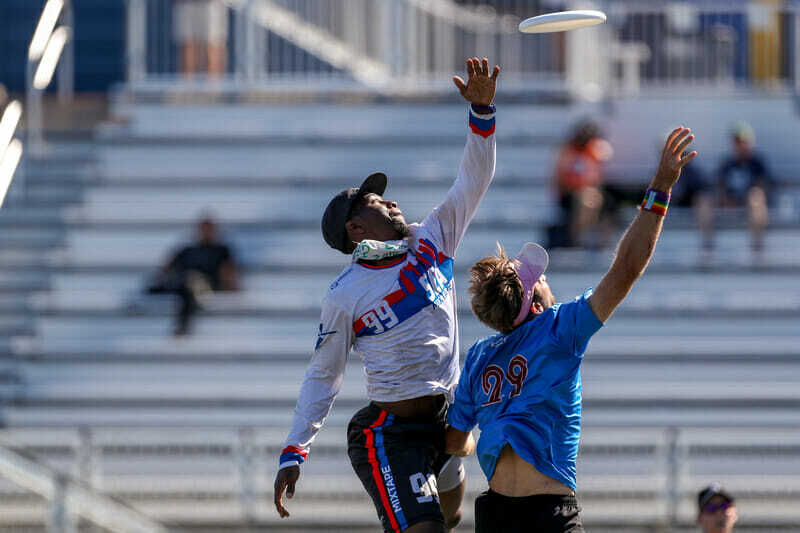 Against Mixtape in the quarterfinals, Taylor took on the dominant handler role after John Kolb went down with a hamstring injury and kept San Francisco in the hunt for a semifinal berth, notching a 1G/4A stat line while also working in his main role of initiating cutter. Taylor showed an innate sense of when to reach for a big huck, when to work the disc underneath, and when to stretch the field to open space for his teammates. With so much turnover on Blackbird this year, they still had an offensive rock to anchor the team on, and Taylor came up big in game after game. He can outrun defenders from the handler position, fire inch-perfect deep throws to his teammates to set up easy holds, and win the disc with his height and vertical skill to be a matchup-proof enigma for opponents to solve. 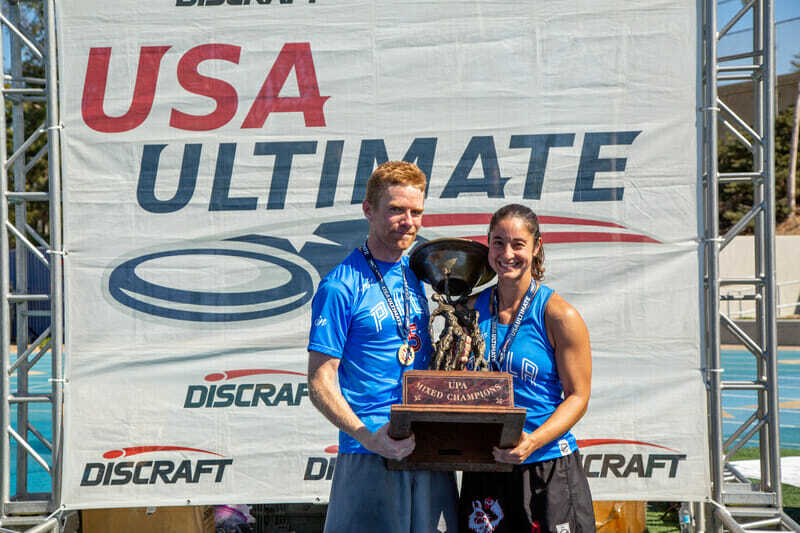 While some may remember Sam Valesano from her time on the USA WJUC squad in 2006, her ascent in the mixed division has been a surprise for many. 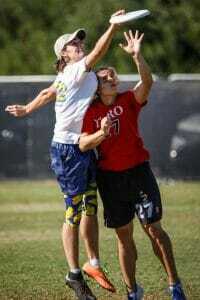 Now, after the 2018 season, Valesano’s dominance has made her one of the most talked about players in mixed ultimate. As No Touching’s all-in-one Swiss Army Knife, Valesano can fill any position on the field where she is needed. She is primarily used as No Touching’s initiating cutter but that hasn’t prevented her from switching roles to demoralize her defenders. According to USA Ultimate, Valesano is one of only five players to record a double-double (goals and assists) at Nationals1, with a tidy stat line of 14G/11A/2D. It’s something of a shame that the rest of the ultimate world hasn’t had a chance to acquaint themselves with one of the most productive players in the Division. Assuming No Touching continues to compete at this level for the next few years, there is no reason to think Valesano won’t continue to light it up with her offensive talents. Boston Slow White has had their fair share of star players in recent years amidst a three-year stretch of semifinal appearances, with Jeff Smith, Tannor Johnson, and Lexi Zalk claiming All-Club status or individual awards. But with all of them missing this year — Johnson swapping divisions for DiG, Zalk swapping allegiances to Snake Country, and Smith simply injured and absent for long stretches of the season — it was Trahey keeping one of the division’s proudest programs relevant. A big thrower who is impressively effective in small spaces for his size, Trahey powers hucks down the field on both sides, uses his length to throw over and around even the largest marks, and never fails to create space for himself to receive a bailout dump from his teammates. In so doing, he did more than simply marshal the Boston offense, he downright dominated, dragging Slow White to the semifinals at the US Open and doing enough to earn a crucial bid for the Northeast. His 23 assists were third most in the division in San Diego; he was also in the top five at the U.S. Open. Simply put, without Trahey’s brilliance for Slow White this season, the longest ever mixed team Nationals streak may have ended in 2018. We here at Ultiworld called out Khalif El-Salaam as a player to watch at the beginning of the season, and he did not disappoint. We figured he needed to have a big year on defense to give Seattle Mixtape another shot at the title, and with breathtaking closing speed and well-timed vertical challenges, he created blocks out of thin air. Mixtape had some uneven results throughout the year, but when they needed someone to step up and get a block, shut down an opposing cutter, or force a handler into a throw they didn’t want to make, it was El-Salaam who got the call. He switched gears between lockdown matchup defense and baiting ill-advised deep looks better than anyone in the division. In a tight prequarters match against San Francisco Polar Bears, El-Salaam landed crucial blocks to open up a lead for Seattle to power them to the quarterfinals. In Seattle’s quarterfinal against Blackbird, he flashed long, aggressive marks to force the Blackbird offense out of its rhythm. His deep closing speed was on display in the final against AMP, where he chased down AMP standout Sean Mott despite an Achilles injury that kept him out of the semifinal against Snake Country. El-Salaam also showed off some of the most underrated elements of defense while out in the semifinal: smart sideline talk and offering insights for his teammates between points to adjust and earn blocks. It’s clear El-Salaam takes defense seriously, and his focus on making plays and helping his teammates step up when he’s sidelined helped push the team to another run at the championship. Space Heater’s Alan Kolick. Photo: Jeff Bell — UltiPhotos.com. 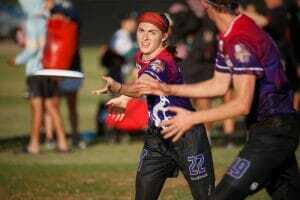 Although Alan Kolick has built a reputation as a potent offensive threat over his years with Washington DC Truck Stop, his defensive prowess shouldn’t be underestimated and he showed it this year as one of the captains of Washington DC Space Heater. As one of Space Heater’s leaders, Kolick stepped up on nearly all of DC’s critical points at Nationals and often ended up on the most difficult matchups, leading the team in blocks in San Diego. Kolick’s presence on defense was notably felt in absence, though, on Space Heater’s double game point against Philadelphia AMP in the semifinal as he sat out the deciding point due to fatigue, and AMP took the point and the win into the final. Still, throughout the season, Kolick was great in the air and on the ground with run-through blocks, and proved time and again that he should be considered with the best not only on offense but as a defensive stopper as well. With all the pedigree on Drag’N Thrust’s roster, it be easy for a younger player to get lost in the bright lights. Apparently Kat Ritzmann didn’t get that memo. 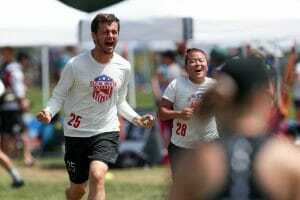 Drag’N Thrust’s sophomore defensive cutter had no problem taking the toughest matchups this season and clearly enjoyed the challenge of beating them in a footrace to the disc. Ritzmann’s defense this season harkened back to a classic, old-school grinder-mentality. Every time she stepped on the field she was locked in and searching for a block. Beating Ritzmann to the disc involved exhausting yourself in the process, and the moment fatigue sets in is when she’s best poised to strike. With every run-through and chase-down block, Ritzmann has continued to build a reputation as an oft-overlooked but potentially lethal defender. If she keeps developing at this pace, she’ll be appointment viewing in a few short years. 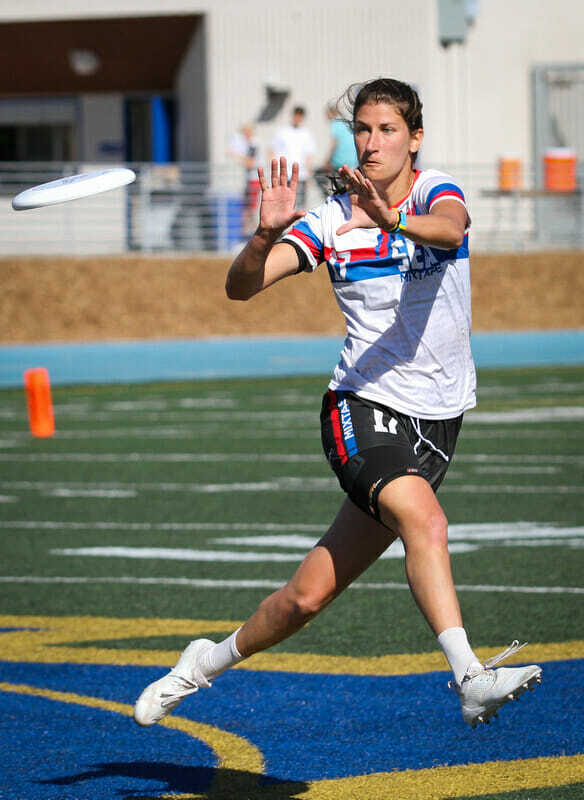 Making the switch back to mixed after a year playing in the Women’s Division, Ellen Goldberg instantly became one of Seattle Mixtape’s primary downfield cutters. Mixtape is a team that thrives on having athletic cutters isolated on offense, and Goldberg’s knack for winning one-on-one matchups in those isolation sets gave Mixtape a reliable spark. With fellow offensive standout Abbie Abramovich missing for much of the regular season, Goldberg stepped up and the Mixtape offense didn’t miss a beat. Goldberg’s height and open-field speed gave Mixtape’s handlers an even greater margin of error than they had in years past. She has a fantastic eye for the end zone, knowing when to cut and how to box out defenders to give her the best shot at reeling in goals. On top of her goal-scoring instinct, Goldberg also showed the work ethic to grind her defenders down. Always willing to cut under and keep the offense cycling, her fitness was yet another advantage Goldberg could bring to the table. It also helped her stay calm and composed with the disc in her hands. Stepping into a prominent offensive role for a new team is never easy for any player, and she added to the challenge by joining the 2017 champions. Testament to how well Goldberg played, Mixtape played as though she had been there for years, and she showed the division just how good she could be. Despite having some of the most talented veteran players in the U.S., Space Heater made a point of giving their younger players a chance to shine. None of these players handled the limelight quite as well as Ted Sither. Space Heater gave him plenty of space in the backfield to operate and rewarded their trust with a patience and precision well beyond his years. At Nationals, he recorded only a single turn over the extended weekend, which is undeniably impressive considering his usage rate. 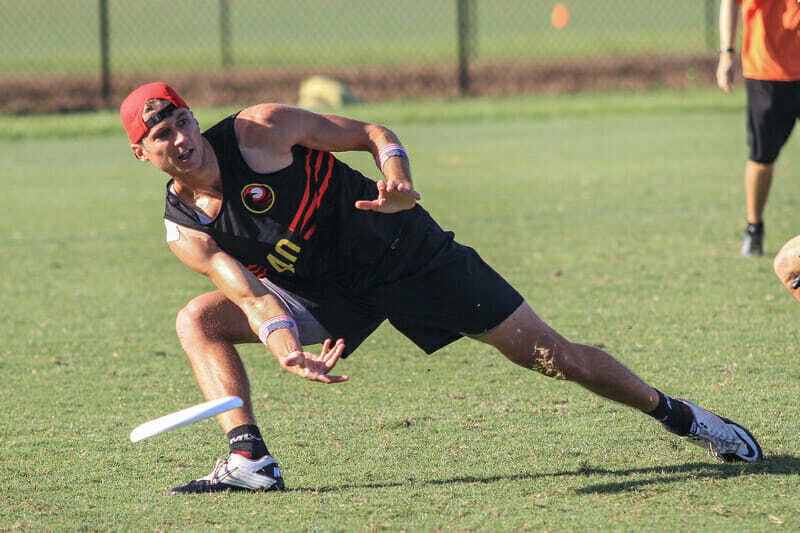 Holding your own while playing with some of ultimate’s best athletes is impressive enough, but Sither also managed to be a focal point, and someone that Space Heater chose to rely on more as the season continued. He ended the tournament with the third most assists of all Space Heater players and the best assist/turnover ratio of anyone. Space Heater’s future as a team might be speculative, but Sither’s future is not. Avid followers of the mixed scene might know Aubree Dietrich already, but she stepped up to new heights this year as Fort Collins shame.’s primary deep cutter. 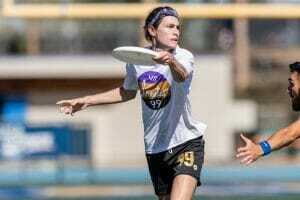 Tied for second in the division with 15 goals at Nationals this year, Dietrich made a name for herself as a deep threat who had no qualms about pushing for as many yards as possible. Shame.’s throwers looked to her early and often, and her relentless cutting kept her defenders constantly off-balance. Her teammates rave about her skill as a cutter, and this year the rest of the division was put on notice. It is not common for a player to stay with one team for thirteen seasons, let alone stay on as a coach once their playing days are done. 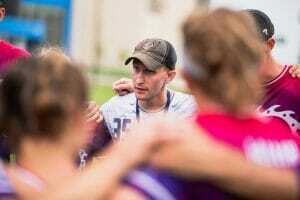 Yet this is the story of Patrick Sherlock, a founding member of Philadelphia AMP and a long-time captain before he moved into the head coaching role in 2014. Honored as Coach of the Year last year as well, Sherlock again proved his credentials as the top coach in the Mixed Division as he led AMP to their first National championship in team history. Coming off a championship final appearance last year, AMP looked poised to make a strong run again this year and Sherlock kept them focused throughout, with wins at the Boston Invite and the U.S. Open to go with semifinal finishes at WUCC and the Pro Championships. With a regional title in tow, AMP came into San Diego as the No. 1 overall seed and Sherlock had them poised to make a deep run at Nationals. But after a double game point loss against San Francisco Blackbird in the final game of pool play, Sherlock and AMP had their work cut out for them. Going into the final, AMP had played three double game point finishes in three days, including a back-and-forth semifinal against regional rivals Washington DC Space Heater. Given the abundance of close results, AMP could have let down in the final but instead it was a Sherlock masterclass. Their opponents, 2017 champs Seattle Mixtape, had a ferocious lineup of defenders led by DPOTY Khalif El-Salaam but Sherlock and AMP’s gameplan of isolating one-on-one matchups led to a clinical win with only one offensive line turnover, securing Sherlock and AMP’s first title. Whether keeping his players steady through multiple double game point losses and wins or setting them up for success with a clear game strategy, Sherlock showed time and again his impact as the best coach in the mixed division. While we wrote about coach Judy Jarvis’ impact on New Jersey Jughandle before Nationals, their performance in San Diego further solidified her case as one of the best coaches in the mixed division. Despite coming into Nationals as the No. 15 seed and being placed in arguably the most difficult pool, Jughandle broke seed as they pulled upset wins over New York Xist and San Francisco Polar Bears on Friday to eventually finish 12th overall. And that, it seems, made all the difference. In his first season as the coach of Minneapolis Drag’n Thrust, John Groess experienced a lot of success the team hadn’t had in recent years. After winning three consecutive championships from 2013 to 2015, Minneapolis went into something of a rebuilding phase. It would easy to view this season as part of the rebuilding process for Drag’n, looking solely at its quarterfinals exit from Nationals. Looking at the season as a whole, Minneapolis took a step towards returning to the top tier of the mixed division. Drag’nN had a stellar regular season with a third place finish at the U.S. Open and tournament win at the Pro Championships. John Groess was right at the center of the success this season, providing a bit more structure for the team and helping utilize its top playmakers in a strategic way. Comments on "2018 Mixed Club Awards, Presented By Greenbackr"